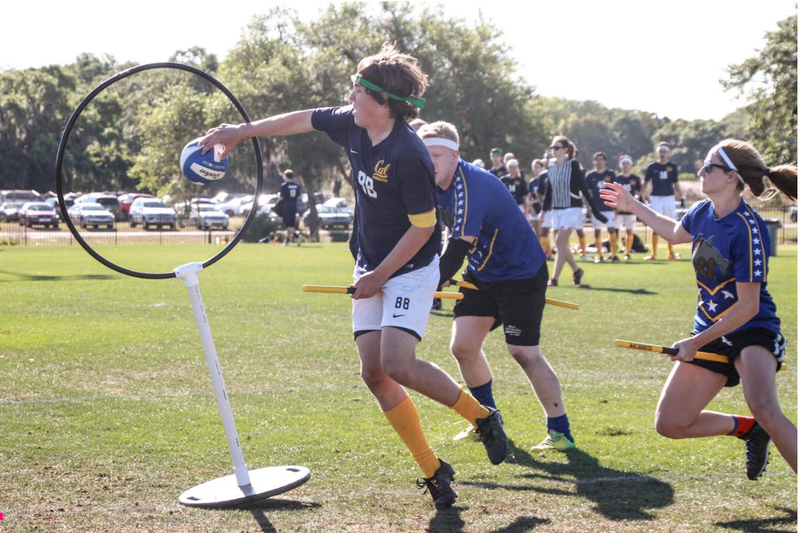 The Cal Quidditch Bears and the BosNYan BearSharks started their day with a match as close as their names. While both squads were missing key players due to travel issues, Cal pulled off the upset against the Northeast community squad. The game never left snitch range, with a small lead being traded off between both squads. While the match featured the great drives and dunks we’ve come to expect from Cal’s Ryan Pfenning and BosNY’s Tyler Trudeau, the game itself came down to snitch–on–pitch play. With powerhouse Gabe Garcez in as the snitch, neither squad could afford to fall behind on quaffle points. Cal started with seeker Ryan Brown before eventually switching to seeker by committee. Both teams kept beaters on snitch, but Cal’s beater play stepped up to the challenge, giving its seekers the time they needed to make the grab. The game ended in an upset for BosNYan, with the win going to Cal and a final score of 160*-130.